PARIS --- French President Emmanuel Macron’s repeated promises to boost defense spending are gradually being revealed as little more than posturing as, after the 850 million euro cut to the 2017 budget announced in July, the increase promised for 2018 has been revealed to be little more than creative accounting. It is becoming clear that the additional 1.8 billion euros promised by Macron for the 2018 defense budget will barely make up for the cuts and spending “freezes” enacted by the Treasury this year. At best, it will be a wash, as shown in the table below, and then only if the funds “frozen” earlier this year by the Treasury are restored. This shows that General Pierre de Villiers, the former chief of the defense staff forced out by Macron in mid-July, was prescient when he protested against additional budget cuts during a parliamentary hearing. And, as he feared, while budget cuts continue, foreign military operations have not been scaled back, and equipment orders are being reduced even as the intense operational tempo is fast wearing out equipment. The above table also reflects, for 2018, the fact that the Armed Forces Ministry will henceforth pay the total cost of foreign operations, whereas until Macron’s election all government departments contributed to a joint fund. Unless additional funds are added to the 2018 budget, it will stagnate compared to 2017, and provide no relief to the armed forces. According to media reports, most if not all of the 850 million euros cut from this year’s budget will be taken from the procurement budget, which will reduce orders for new equipment by up to 15%. 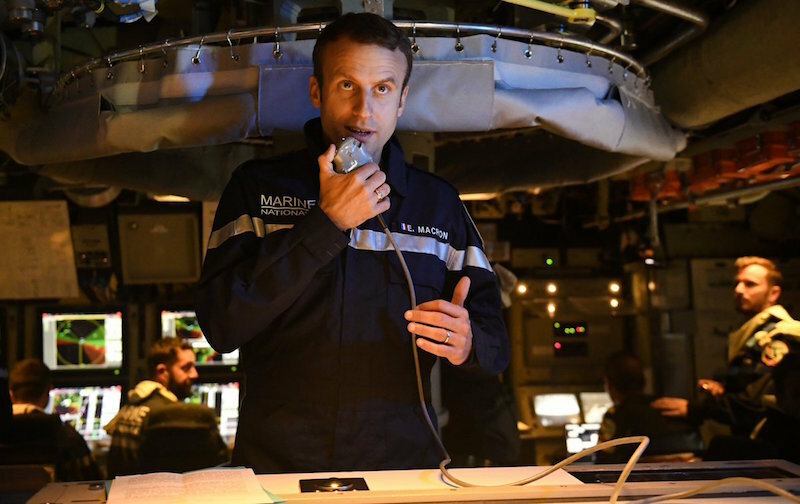 The consequence will be more delays in getting new kit to the forces, even though Macron had claimed that “this will in no way limit our operational capabilities. Details of the cuts and delayed orders will not be known until later this year. Furthermore, although Macron promised in mid-July that the defense budget would be the only one to increase in 2018, government sources quoted by the newsweekly Le Point warned that “There will be program delays, and they will be discussed with the defense staff. They will be few from 2017 to 2018, but more from 2018 to 2019,” clearly implying that defense funding will continue to stagnate. The above demonstrates that Macron’s high-visibility visits to the armed forces, during which he donned their different uniforms, was little more than play-acting, and only disguised his disinterest for the armed forces for a very short time. Meanwhile, Armed Forces Minister Florence Parly remains silent. To some observers, Macron’s propensity to dress in uniform while visiting the forces is merely playing out his boyish fantasies. “Macron opted out of military service, and knows nothing about defense, so now he gets a kick out of dressing up and playing soldier,” a political opponent told Defense-Aerospace.com. Others take a more moderate view, but regret that Macron’s subservience to EU budget caps led him to cut defense spending while troops are engaged in combat on two fronts, in Africa and in the Middle East. But, whatever the reason, the promised increase in defense spending is a mirage.